In his cookbook Les Halles, Anthony Bourdain writes: "You want to make a Frenchman cry? Make him a nice bowl of pot-au-feu. This is soul food for socialists." Being of Italian-American descent, while I enjoy a nice bowl of pot-au-feu, it has yet to bring any tears to my eyes. You want to make an Italian-American cry? Make him a nice braciole. However, that is just the basic braciole, as there are many varieties. My Uncle Louie used to layer prosciutto, garlic and parsley between the pork shoulder and ground pork. Some people leave out the hard-boiled egg in the center, a sin in my book. Some people prepare it as a giant loaf and serve it in slices. Most Italians that I grew up with have fond memories of braciole, and finding it featured on a menu is a rare delight. Western New York has a glut of Italian-American restaurants. Having a mother who is a wonderful cook can make those restaurants a nightmare for me, because I am picky about what I consider quality Italian-American food. I have had some local braciole that have been way too dry, or the egg has been overcooked in the center, turning it to rubber. Only a few restaurants in town that I am aware of which serve braciole on the regular: Sinatra's, Romeo & Juliet's, and my personal favorite, Panaro's. Panaro's, 571 Delaware Ave., is a rare bird in the restaurant world, only open Monday through Friday for lunch. Brothers Michael and Tony Concialdi, Kenmore natives, decided to run their family’s bakery and restaurant downtown. Since I find myself downtown for work a lot, Panaro's is the perfect restaurant for a relatively quick, yet delicious lunch. While I can rave about their wonderful sauce, slightly sweet but intensely flavorful, and their house-made Italian cookies, their pièce de résistance is the braciole ($10.95). Pictured above, it is only served for Wednesday lunches. A steaming plate of succulent pork arrived at my table, smothered in thick Sunday sauce that I could smell coming before it arrived. I sliced into the red mound with a fork. The meat was so braised that it instantly fell apart, revealing a treasure, a perfectly cooked hard-boiled egg waiting at the center like a golden surprise. The braciole was tender and delicious, porky and wholesome. Now, that's a nice braciole. Next to the braciole was a link of Italian sausage ($2.25) and sautéed mushrooms ($1.50) for that extra umami kick. The sausage is sourced locally from Lorigo's Meating Place and is full of fennel and aged Italian cheeses. 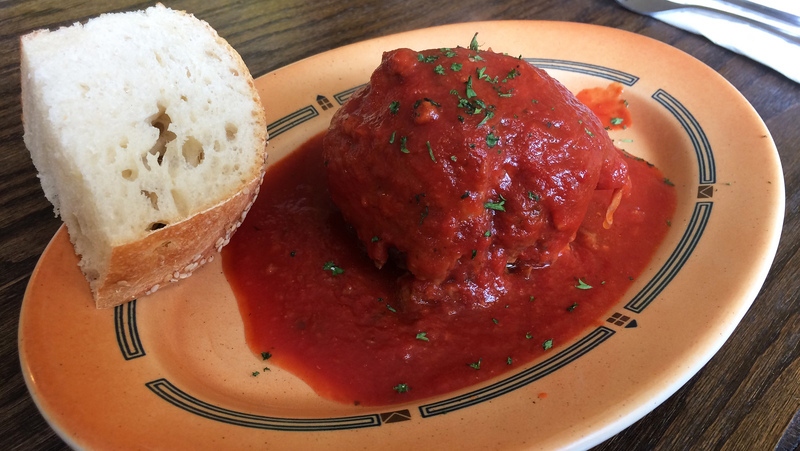 As I picked up the scarpetta, a piece of crusty, Italian bread to clean the plate of sauce, I was bursting with food and memories of my family yelling, laughing, and eating. 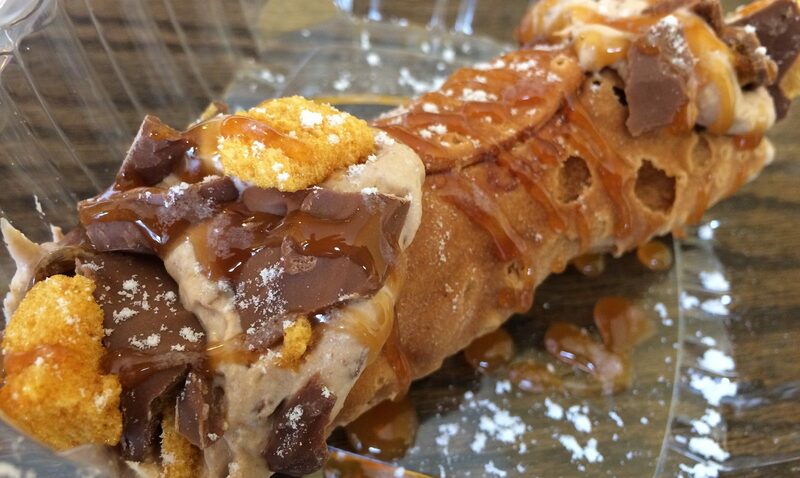 Bringing me back to reality, a sponge candy cannolo was delivered to the table, combining a Buffalo favorite with the classic Italian dessert. Take the braciole. And the cannoli ($4 large). The shell was perfectly crunchy, as the rich ricotta stuffing had yet to seep through. The ends were dotted with crushed pieces of sponge candy, which added an additional crunch and nostalgic flavor to this decadent dessert. This was the type of dessert that would make my Nonna smile. If you are looking for a taste of authentic, Western New York, home-style Italian, comfort food, try Panaro's for lunch. While there may be hundreds of choices in the area, in my opinion nobody does it better than the Concialdi boys. Joseph A. Leta is an Amherst attorney who specializes in criminal, business and divorce law whose lifelong goal is to find the world's greatest foods, and eat them.